When you live in a temperate climate, you just can’t escape the fact that sooner or later, you will need a waterproof jacket. Equally inescapable is the dreaded ‘boil in the bag’ syndrome. You can keep the wet out, but as you warm up, you start to produce your own, highly localised and supersaturated, micro climate. The net result – you end up just as wet as if you had never put the thing on in the first place. You are generally warmer though! 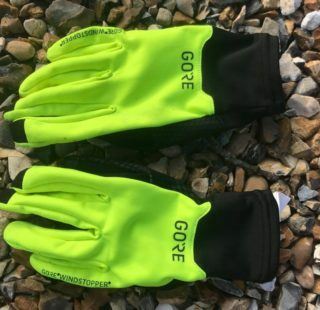 Gore claim they have the answer with their Gore-Tex and Shakedry technology. 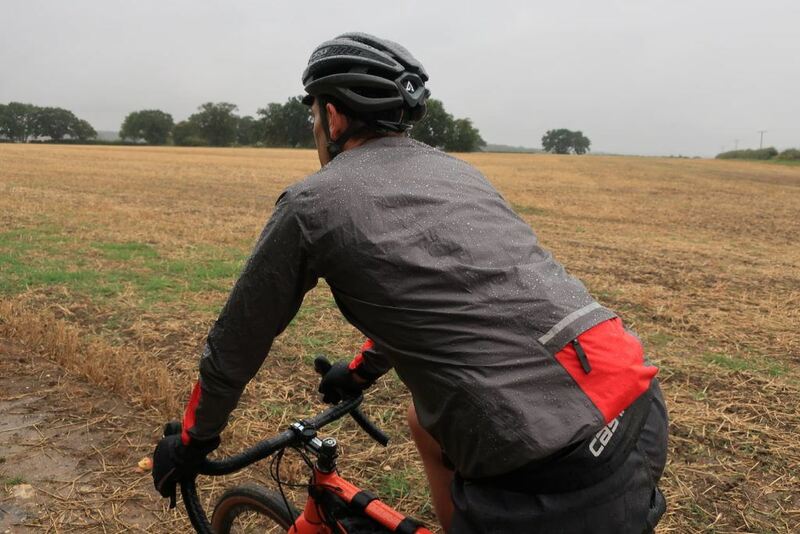 We were able to put this to the test with the Gore C5 Gore-Tex Shakedry 1985 Viz Jacket. The ‘Viz’ part of the name isn’t a homage to the comic book, but the high visibility red elements on the sleeves. You have probably come across the Gore-Tex and Windstopper fabrics before. They are widely used by the manufacturers of all sorts of outdoor wear. Castelli for example, use them (under licence) in a number of their premium garments such as the Gabba and Perfetto. The USP of Shakedry is that it’s combines maximum breathability while being totally waterproof, all wrapped up in a super lightweight package. Water beads off this jacket like a non-stick frying pan! You can read all about the tech here. Shakedry water beading tech in action. Our medium sized test sample weighs in at a superlight 130g. Considering the jacket features a full length 2-way front zip with weathershield, a high neck with an adjustable velcro collar and a large zipped pocket on the rear, this is remarkable. This is definitely not an expensive bin-bag poncho. The ‘Viz’ tag in the name refers to extra reflective elements on the jacket, along with the bright red fabric panels on the cuffs and the rear. 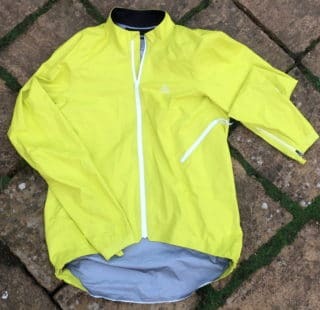 The jacket is available with hi vis yellow (instead of red) if you prefer. An even lighter jacket (116g size large), the C5 Gore-Tex Shakedry 1985 is available albeit without the additional reflective panels. Not only is the ‘Shakedry 1985 Viz’ extremely light, it is also packs up really small. It will easily fold up and store away in a jersey pocket with room to spare for a pump, bars, phone and still not feel uncomfortable. On the rear is a wide, zipped pocket with a storm flap for extra weather protection. Cleverly, the jacket folds up into this rear pocket for convenient storage. More ‘viz’ elements on the rear of the Gore C5 Shakedry. Bright red pocket and reflective detailing just above the zipper. A word on packing: The Shakedry material creases very easily which lets water sit for longer on the jacket, rather than ‘shake’ off. If the jacket becomes heavily creased, it will ‘wet out’ a lot quicker. So don’t just scrunch it up. Fold it carefully! Beware, the jacket is very thin and light. Although it is well made with taped seams and is very durable for such a garment, as with any super light clothing, you have to treat it with care and respect. Don’t go crashing through a thorn bush and expect it come out the other side in one piece is what I’m saying. You have been warned. 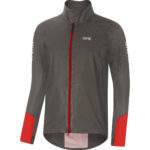 Gore’s C5 clothing is considered to be a more ‘relaxed’ fit than their full on racer fit C7 range. Having said that, the Gore C5 Gore-Tex Shakedry 1985 Viz Jacket is not, is a baggy, flappy jacket. I’m usually a medium and this (medium) jacket fits perfectly. It is a slim fit but there is ‘room’ for additional layers underneath. 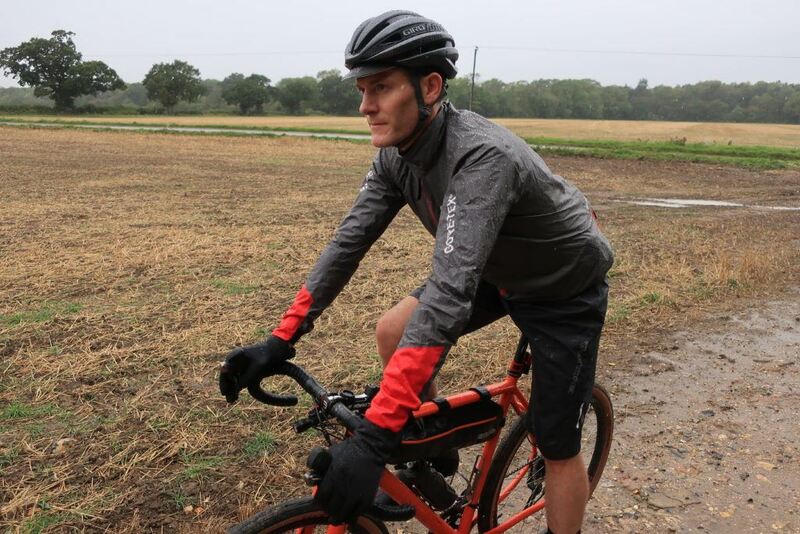 The arms are plenty long enough to fit over the top your of gloves, preventing cold draughts blowing up your arms when riding in the drops. Elasticated cuffs ensure the sleeves stay exactly where you want them. The jacket has a generous dropped tail at the rear. 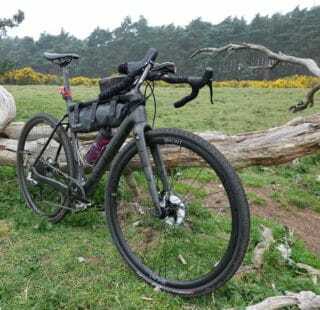 In use, with loaded jersey pockets, the tail tended to ride up unless I weighted it down by stashing stuff in the rear zipped pocket. 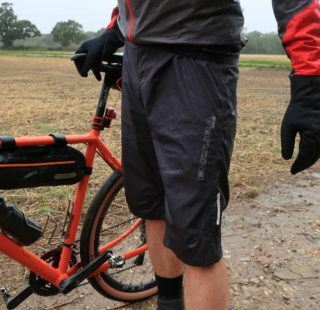 Teamed up with a pair of waterproof shorts, this wasn’t a huge issue and I still remained dry throughout the test. The high neck offers excellent coverage around your neck and the velcro adjustment allows you to opt for a snug or loose fit as preferred. While initially being sceptical about Gore’s claims for the fabric, I soon had to eat humble pie. 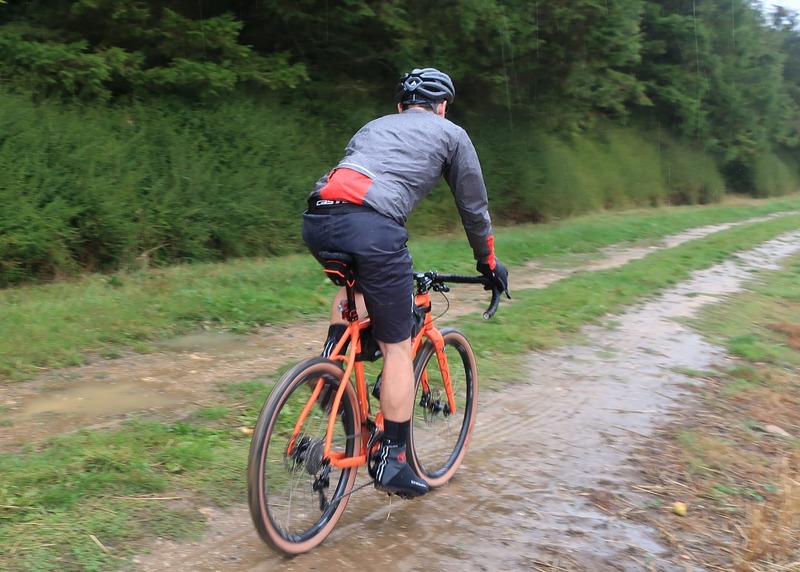 An early autumn shower gave me perfect test conditions. Wet and humid. If ever I was going to boil in the bag, it was going to be now! Here is where Gore’s jacket blew me away. It really did manage to perform the impossible. It wicked moisture away but kept the rain out. Rain beads off the Shakedry like no other. Most jackets manage to shrug off rain to a point before they become wetted out and stop being waterproof. Gore keeps on beading water off all day long and no matter how hard you are working, it remains breathable. Admittedly I did get to a point where my baselayer and jersey became too warm. You still need to layer appropriately. Loaded jersey pockets do seem to encourage the jacket tail to ride up unless you stash some weight into the Gore’s rear pocket. Not surprisingly the Gore Shakedry is also an admirable windproof and even on exposed descents into headwinds, I kept warm enough. Washing is simplicity itself. All it needs is a low temperature cycle with liquid detergent. Gore advise against tumble drying, so just leave it to dry naturally and as mentioned earlier, try to avoid creasing. And as there is no DWR treatment, you don’t need to use any reproofing sprays to prolong the waterproof qualities of the jacket. 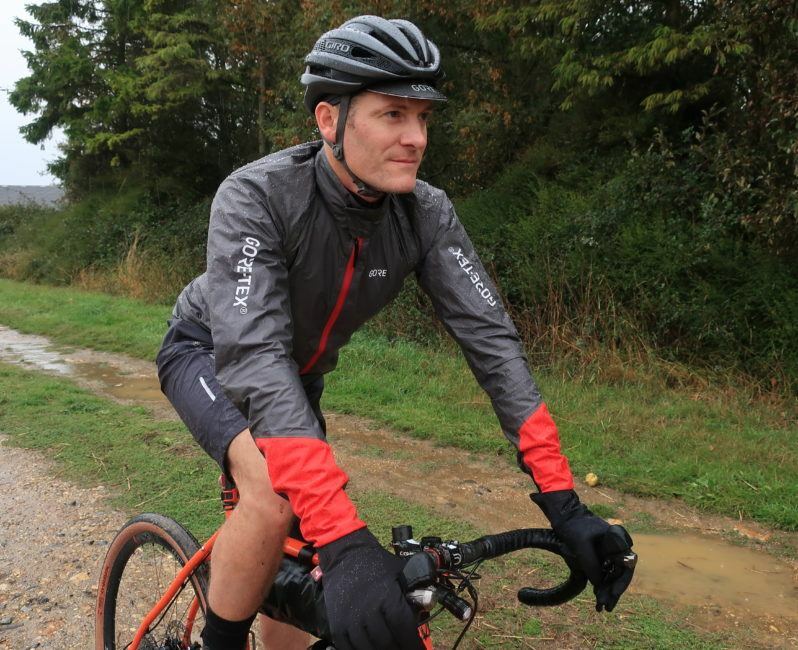 Priced at £250 the Gore Shakedry jacket may seem expensive, but it genuinely is the only waterproof jacket you’ll ever need. I have no doubts of its quality. It will probably last you a long time if taken care of. 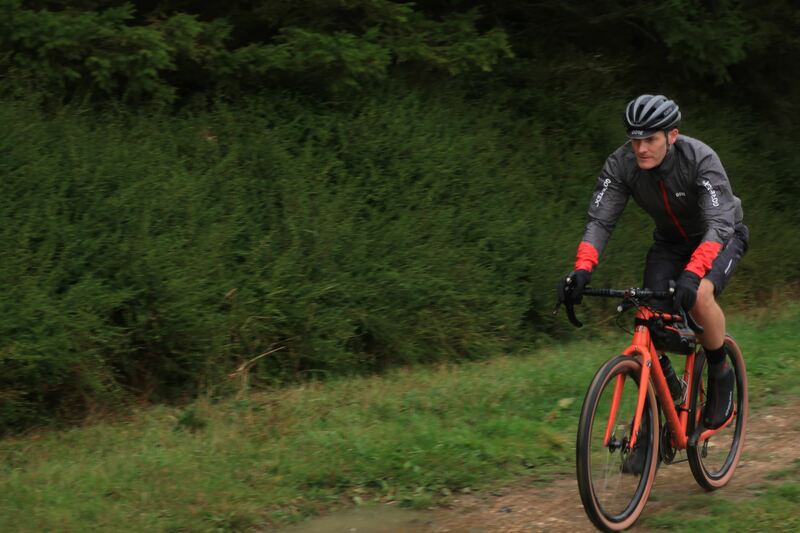 If you want to ride in wet conditions in a degree of comfort, don’t hesitate to make the investment. Delicate material - take care not to rip it!